These are classic butterball cookies that I would make with Mother Lovett while she was still kickin’. If you have someone in your life that prefers treats on the milder side and does not like treats that are very sweet, these butterball cookies are for them. However, I have zero concept of someone thinking a food is too sweet. That’s impossible. I broke out her old, handwritten recipe. There are strict instructions to not refrigerate this dough. They must be rolled into balls right away. Of course I followed these instructions. I can’t imagine being haunted by Mother Lovett from her grave. I can just see her ghost following me through the grocery store and throwing stool softener, maxi pads with wings, and chipped ham into my cart. We always stuffed the cookies with 2 things: pecans and maraschino cherries. Luckily, I had some pecans hanging around. Unfortunately, I did not have any maraschino cherries. I just can’t be trusted. I enjoy the crack cherries too much. But I highly suggest you try them! They are fabulous in these cookies. After rolling the cookie into a ball, push a pecan inside and continue rolling the dough around it. I made a few plain ones, but most are stuffed with pecans. 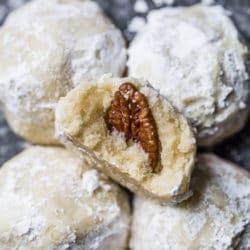 These are one of my mom’s favorite cookies, and she likes the pecans inside. They come out looking buttery and delicate. And with a surprise inside – the pecan! After they cooled, we would roll them in powdered sugar. I bet you didn’t think there was a wrong way to coat cookies in powdered sugar. These classic butterball cookies are a favorite that my grandmother made every year at Christmas. They are a light cookie that isn’t super sweet and the center is filled with either a pecan or maraschino cherry. Classic and delicious! Cream butter and sugar until fluffy. Add vanilla. Mix in flour and salt until combined. Roll dough into 1 inch balls. Stuff each ball with a pecan or maraschino cherry. Place on baking sheet 1 inch apart. Bake for 8 minutes, or until bottoms are golden. Once cooled, roll in powdered sugar. Makes roughly 24 cookies. Alas, there is. Mother Lovett told me so. I made these last night and they were really good! I made them plain (didn’t put anything inside), rolled in the powdered sugar, and then added Hershey’s kisses right out of the oven while still warm into the center. pics will be on instagram under robinmommy. Pingback: Holiday Cookie Recipes: Butterball Kiss Cookies - It's Yummi!